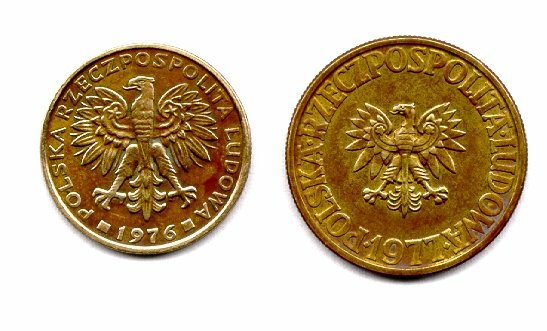 You didn't expect my coin collection to be complete without some coins from Poland, did you? I know, this is supposed to be about OLD coins. In a country where inflation is as bad as it is in Poland, every generation or so they lop off a few zeros from the ends of all their denominations and start all over again. This renders all of the previous coins pretty much useless, so they get thrown away. The 1960's and 1970's are the oldest I could find. Aren't these eagles beautiful! The coins above are older than the brass ones, and are made of aluminum. Groszy (GRO shy) means "peas". There were 100 groszy in a zloty. It was an impossibly small unit of money even when these coins were new! If you bought a book of matches with a zloty, you got some groszy as change. The larger 10 zlotych and 20 zlotych coins were made of a more durable alloy, like our nickels.